Half Term Catchup! Has Spring Sprung? 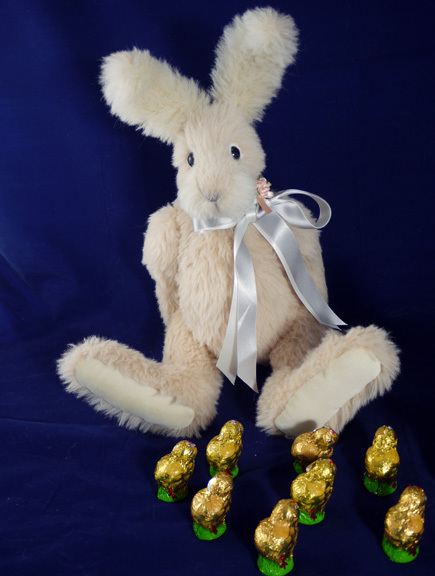 Half term holiday, so the chance to catch up with things, including photographing some of the latest Teddybuys bears and hares. I'd like to introduce Camille. 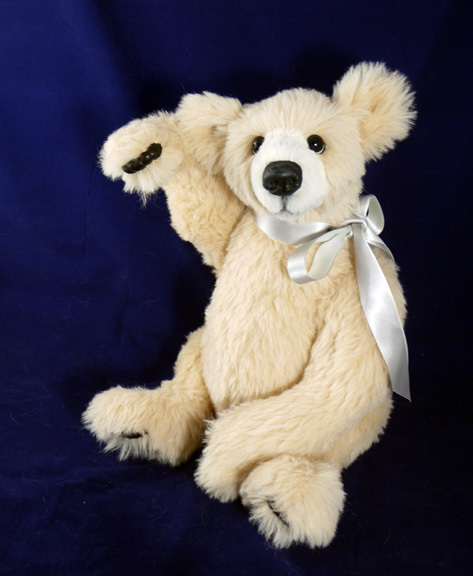 She is made from a beautiful, soft blush coloured Schulte alpaca with an ivory alpaca muzzle. She has been designed to sit. She is about 14 inches sitting and 19 inches stretched out. Her paw pads are made from a soft, dark brown leather. Her nose has been hand-moulded. She is stuffed with Bouncifill and plastic beads for extra weight. Her eyes are black English glass, with white and black felt eye rims. She is finished with a silver satin ribbon. She has 6 joints, including a double-neck joint tfor lots of posing possibilities. She is one of a kind. Her adoption fee is £150 plus postage. Manuka is a 15 inch bear made from a lovely rich brown Schulte alpaca with a fawn alpaca muzzle. 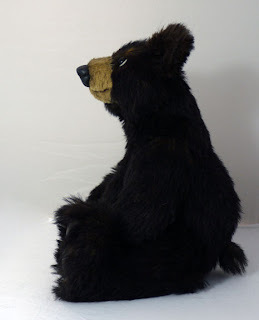 He is designed to sit and has paw pads made from black leather. He has 6 joints including a double-neck joint and is softly stuffed with polyfill and plastic beads for a good cuddle. 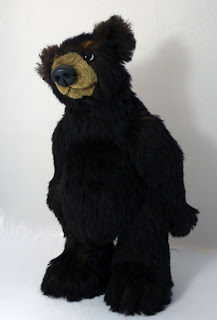 His face has been needle-sculpted and his eyes are English glass with white and black felt eye rims. His adoption fee is £130 plus postage. 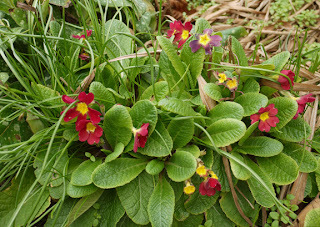 I'm not sure that Spring is here in Kent yet. It still feels very cold and we have had a lot of very dull days lately...but nevertheless I am determined to get into 'Spring mode'. 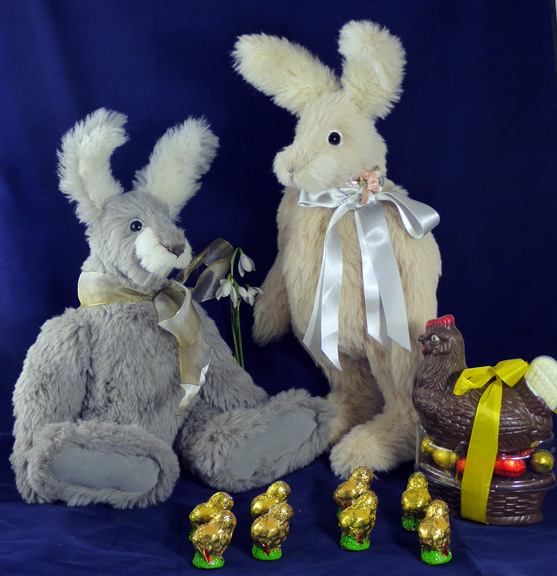 I thought Herbert, my grey hare looked rather lonely, so made him a companion, the lovely Peaches. She is made from the same lovely Schulte alpaca as Camille and she also has 6 joints, including a double-neck joint. Like Herbert, she looks great standing or sitting. She is about 20 inches standing (to the tips of her ears), so is quite substantial. She has pretty silver and white satin ribbons around her neck. Her adoption fee is £120 plus postage. 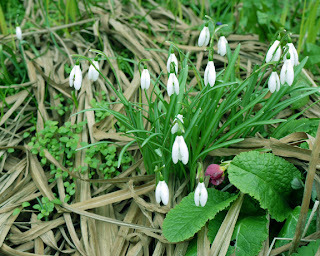 I managed to get into the garden to take a couple of photos of the first signs of Spring. We are told it will get warmer in a couple of days!!! Hurrah! 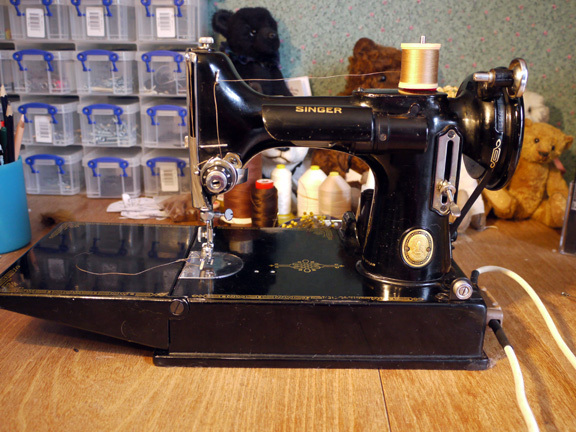 I decided a while back that I didn't want to be without a sewing machine, while my Bernina was away for a service each year, so I bought an old Singer Featherweight as a back-up machine. 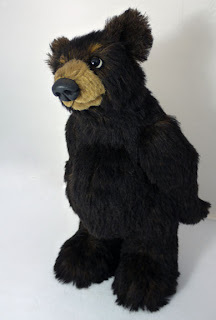 How addicted to bear-making am I that I don't want to be without a machine for a week?? Anyway, I am absolutely delighted with it. It came back from being serviced last week and it runs like a dream. I love it. I have a feeling that the Bernina is going to be relegated to back up machine. My father is very keen on Meerkats, so my next project is to try making one. Wish me luck! 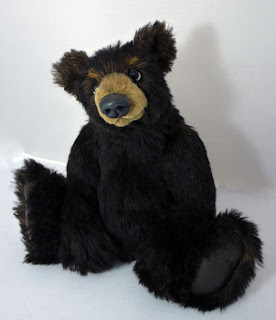 I'm pleased to introduce Bramble, my latest black bear cub. 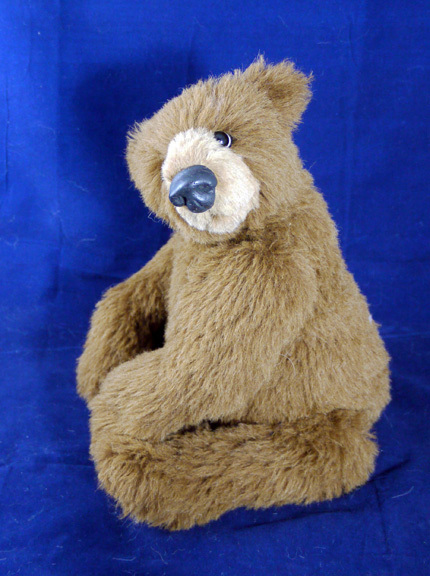 He is made from the last piece of a lovely Schulte alpaca that I have. It is a very dark brown, almost black tip with a dark reddish brown undercoat. It is difficult to describe, but very natural looking. 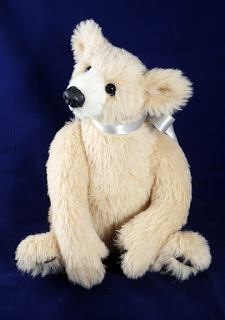 He is designed to stand or sit, with six joints including a double-neck joint. 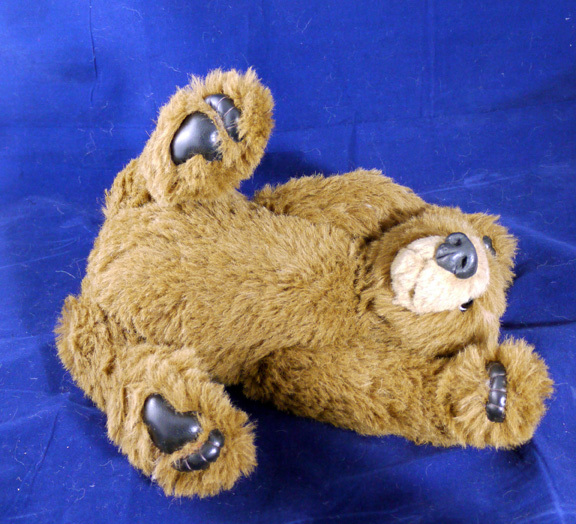 He feet and paws are sculpted, brown leather. His eyes are English glass eyes with a felt backing. His face is needle and scissor-sculpted and shaded. He is stuffed with polyfill and plastic pellets. His nose has been hand-moulded from epoxy clay. He is a greedy, little cub with rather a large tummy. He is looking for a new home. 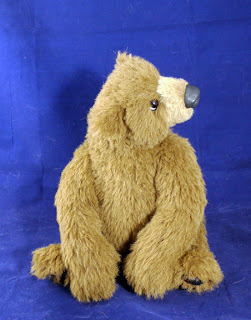 He is £130 plus postage.